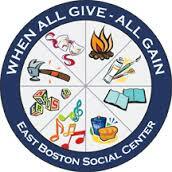 Founded in 1918, East Boston Social Centers, Inc. is a 501 (C) (3) multi-service agency, serving culturally diverse families and individuals of all ages in East Boston and throughout Greater Boston. The programs offered by the Social Centers are designed to meet people’s educational, social and recreational needs and to build community and strengthen families. The Social Centers seek to create a welcoming and supportive environment, characterized by a spirit of goodwill and caring, in which members of our community are empowered to lead productive and fulfilling lives.